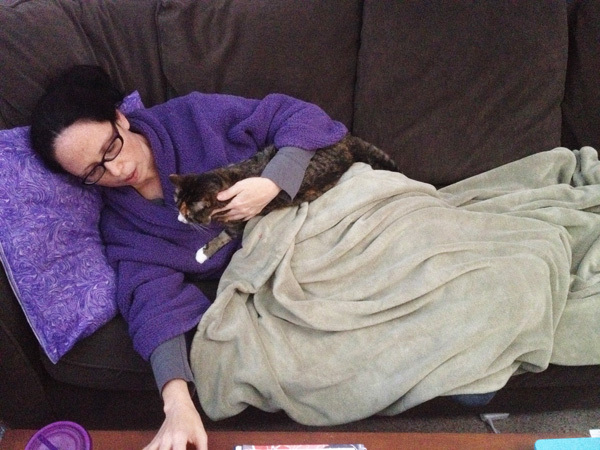 Since I've been sick, my three cats have taken turns "taking care" of me, with varying results. I’m currently riding the tail end of a nearly three-week case of the crud. Seriously, I don’t know if it will ever end. My ribs are still so sore from coughing — I sort of feel like someone kicked the crap out of me. My husband said, “You’re kind of like Jesse from Breaking Bad.” Yeah, I don’t quite feel like a meth dealer who’s been pounded by a DEA agent, but my ribs have definitely seen better days. I’ve been opting to work from the sofa the last few weeks. That way I can stop and nap as needed, and I’m able to watch reruns of Golden Girls and Project Runway while I write bits and pieces of funny stuff between hacking up bits and pieces of not-so-funny stuff. All the while, my three cats took turns “taking care” of me. This was mostly a positive experience for all of us, but some of our moments together were better than others. Here are some of the pros and cons of having my cats as my health care providers. My Cosmo is a snuggler extraordinaire. He wants to press his body as close to me as possible and infuse me with his kitty warmth and rumbly purrs. 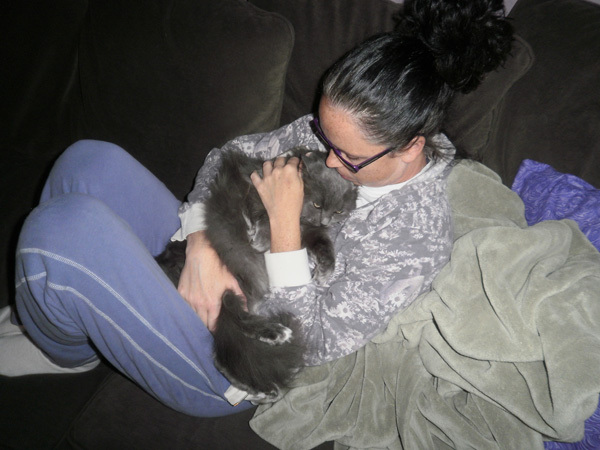 Purr therapy. 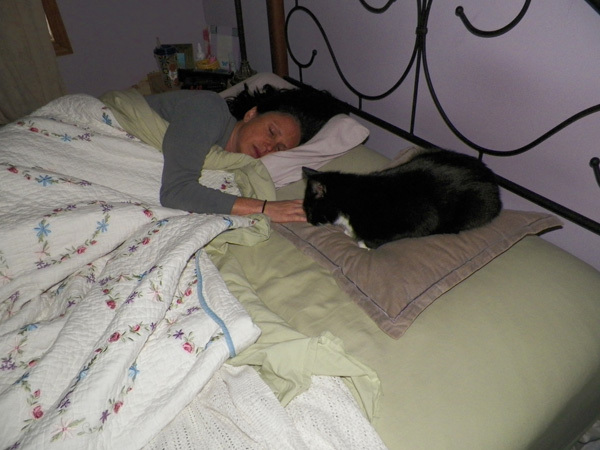 This is the absolute best part of a cat’s bedside manner, in my opinion. 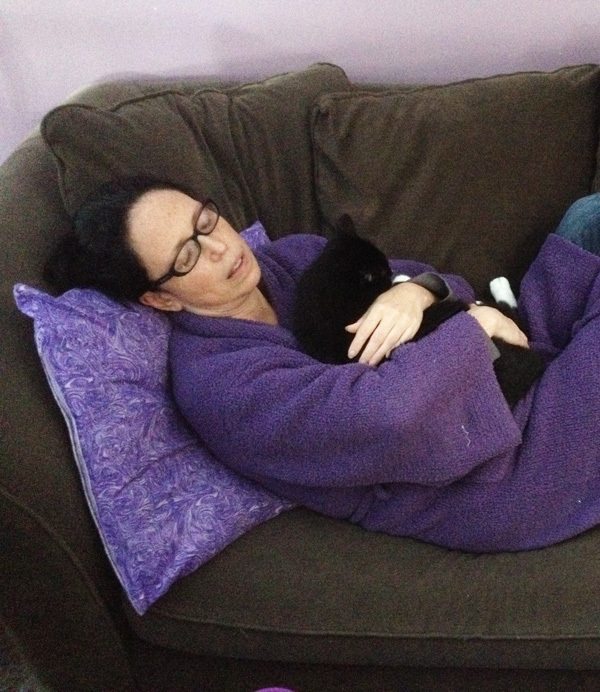 Who doesn’t love a cozy snuggle, especially when they don’t feel well? 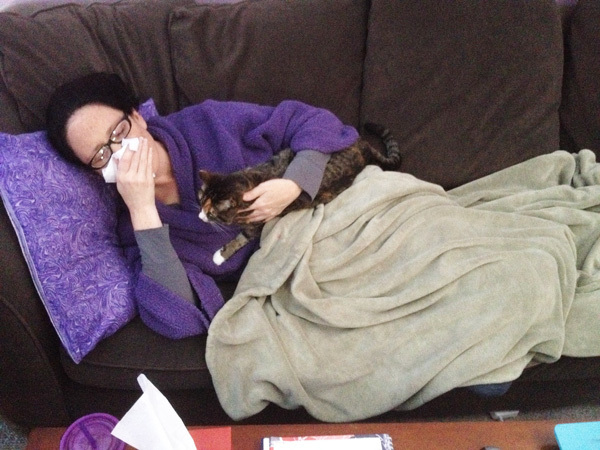 I’ll admit it: When I’m sick, I’m a little bit of a whiner. My husband is a much more patient caretaker than I. He lovingly caters to my whiny whims, even when I settle into annoying baby mode. Right about now, though, I’m starting to test even his patience. It’s been almost three weeks, after all — who wouldn’t start to lose a little of their inner Florence Nightingale? Cats, that’s who. They couldn’t care less if I whine and complain all day long, as long as I allow them space to snuggle, scoop their litter boxes and don’t miss mealtimes. Theirs, that is. They don’t care if I eat. I won’t lie — I’ve been looking pretty rough. If you could see me typing this right now, you might need to shake your Etch-a-Sketch brain to erase that image. My cats think I’m beautiful all the time. They look at me lovingly whether I’m dolled up for a night out or pasty white and haven’t showered in a couple of days. Honestly, my husband’s the same way. You know someone loves you when you look like the Crypt Keeper and they still want to nuzzle your neck. My Cosmo isn’t what I’d call “dainty.” He’s not overweight, but he’s a sturdy fella. Remember when I mentioned he likes to press his body against mine? Well, sometimes he likes to press that sturdy body right on top of my chest. Once or twice my eyes have popped open, panicking that I couldn’t take a deep breath. And then I saw slug-a-lug perched on my chest and gave a shallow sigh of relief. 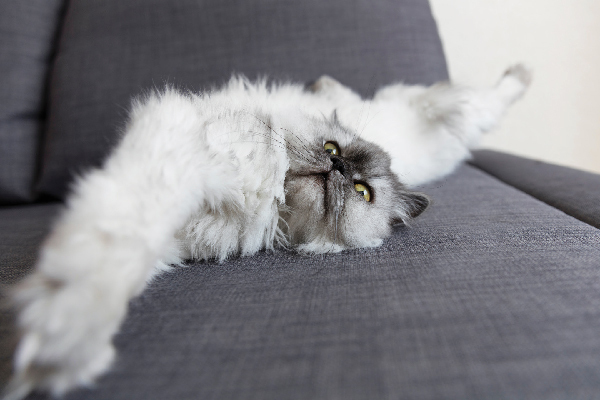 Nothing is a bigger kitty-snuggle buzzkill than a jolting sneeze or a hacking cough. I always feel so badly for them. They’re all cuddled up and we’re peacefully watching Tim Gunn snark at some Project Runway contestant, and then a series of sneezes spoils the scene. My cats can’t remove themselves quickly enough. I try and keep all the necessary sickbed items at arm’s length, but sometimes the get-well cards are not stacked in my favor and a curled-up kitty prohibits me from reaching a tissue when I need it. At those times I wish I had Stretch Armstrong arms. I hate to disturb the cat, especially since they’ve probably just recovered from one of my coughing or sneezing episodes. It’s amazing how long you can sniffle along with a runny nose before things get messy. Even with the runny nose, sneeze disturbances and heart attack scares, I’d say the pros outweigh the cons any day. 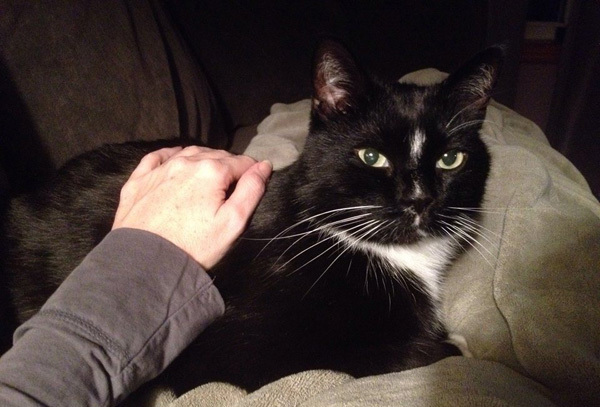 What are the pros and cons of your cat as a health care provider? Tell us in the comments!